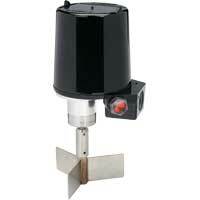 The Proximity Mark Series is a line of position indicators with a selection of various output options. Four model styles make up the Mark series to cover almost any application. Standard models in the Mark Series have visual position indicators and are weatherproof, explosion-proof, and submersible. 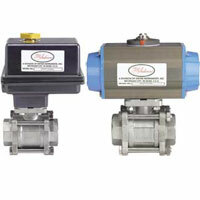 A large variety of outputs are available to fit specific applications. There is a choice of 1 to 6 switch outputs of 14 varieties including inductive sensors, high temperature switches, gold contact switches, hermetically sealed switches, and high current switches. 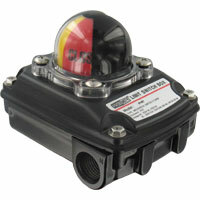 Besides the switch outputs, the Series offers potentiometer outputs, transmitters, and HART® Communications. The units are purchased for either direct drive applications, such as rotary valves, or lever drive applications, such as linear valves. 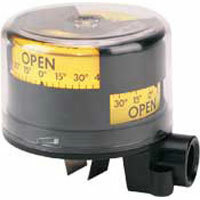 Adjustable visual indicator is standard on direct drive units that displays OPEN/CLOSED status and degrees. A magnetic drive that completely seals the switch compartment from the atmosphere for maximum leak protection is utilized in the Mark 1. The Mark 3 uses the same magnetic drive of the Mark 1, but it can be used for multi-turn applications with 1 to 25 revolutions, such as gate valves. A through shaft drive is incorporated in the Mark 4 making the unit a lower cost alternative to the Mark 1 for applications that are not as demanding. Mark 1 and 4: 5 to 360°. ±0.5% of full span. Optional ±0.25% of full span. -40 to 176°F (-40 to 80°C). [ATEX flameproof, -B suffix, rated -40 to 80°C (-40 to 176°F) for switch type A, G, M, O, R, S, T, V, or W; -25 to 80°C (-13 to 176°F) for switch type B, D, or I; ATEX intrinsically safe, -IS suffix, rated -25 to 40°C (-13 to 104°F) for switch type I; -40 to 40°C (-40 to 104°F) for switch type O, R, S, V, or W]. 1000Ω standard. Optional 2000, 5000, 10000, or 20000 Ω.
Span trim pot with 2000Ω adjustment. No zero adjustment. Mark 1 and 4: Minimum 0°, Maximum 340°; Mark 3: 0 to 10 revolutions. Trim pots for adjusting both. 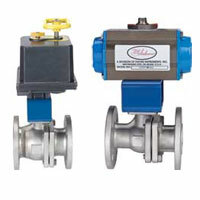 Mark 1 and 4: Span is adjustable from 50 to 300°; Mark 3: Span is adjustable from 1.5 to 8.5 revolutions. 3/4" female NPT standard. Optional one or two 1/2" female NPT. M25 X 1.5 and M20 X 1.5 optional. Mark 1 and 4: Minimum 50°, Maximum 300°; Mark 3: Minimum: 1.5 revolutions, Maximum: 8.5 revolutions. -40 to 176°F (-40 to 80°C). [ATEX flameproof, -B suffix, rated -40 to 80°C (-40 to 176°F) for switch type A, G, M, O, R, S, T, V, or W; -25 to 80°C (-13 to 176°F) for switch type B, D, or I]. Rx = 500 kohm; Cx = 2500 pF. Pushbuttons or HART® master for setting both. Mark 1 and 4: Span is adjustable from 0 to 330°; Mark 3: Span is adjustable from 1.5 to 8.5 revolutions. 3/4" female NPT standard. Optional one or two 1/2" female NPT. M25 and M20 optional. Mark 1 and 4: Maximum 330°; Mark 3: Minimum: 1.5 revolutions, Maximum: 8.5 revolutions. Features a magnetic coupling that isolates the switch compartment, completely sealing the unit from the surrounding atmosphere for maximum hazard and leak protection. EZset cams on switch models provide simple set point adjustment. Flexible design allows multiple switches and transmitter options. Multi-Turn models that can provide switch signals between 1 and 25 revolutions, and transmitter models for up to 10 revolutions without gear reduction. Thru-Shaft design that features a 1" bearing for long life and o-rings to seal the switch compartment for hazard, corrosion, and leak protection. A lower cost alternative to the Mark 1 Series for less demanding applications. JUNCTION PACKAGE: Complete factory assembled packages combine visual indication, solenoids, switches and transmitter in a single convenient UL, CSA, ATEX, or SAA certified assembly which saves labor and reduces cost. The simple package is shipped ready for installation, complete with a custom designed mounting kit for your specific application. Many options are available such as painted aluminum, epoxy coated aluminum or stainless steel housings including a standard 3/4" NPT conduit entrance and choice of 1 or 2 additional 1/2" NPT conduit entrances. The optional conduit entrances are drilled and tapped in the base of the position indicator housing and solenoid valves are screwed into the entrances. 22 to 16 AWG wire leads from solenoids, switches and optional transmitter are terminated in prelabeled, easy-access terminal strips protected inside the housing. Note: UL, CSA, ATEX or SAA approval requires complete package assembly by Proximity. 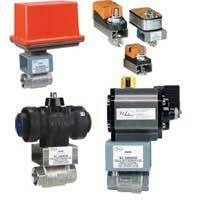 Consult the factory for recommended UL, CSA, ATEX or SAA approved solenoid valve options. FACTORY SEALED LEADS: Eliminate the possibility of conduit contamination and the need for seal fittings with Proximity's factory sealed (potted) leads. This seal has been UL tested to 6000 psi (422 kg/cm²) and listed for Class I, Groups A, B, C, D; Div. 1 & 2 atmospheres. Groups may vary depending on the switch model. Standard leads are 18 AWG and 36" (91.44 cm) long. AS-INTERFACE: AS-Interface allowing networking of up to 31 devices over a 2-wire network. Option for Mark 1 Magnetic Drive and Mark 4 Thru-Shaft Valve Position Indicators. 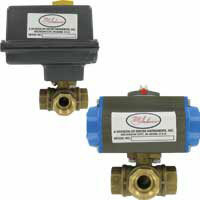 Available with 1 or 2 incoroprated solenoid valves. MOUNTING KITS: Mounting kits with drive yoke or slotted lever arm, bracket, fasteners and other zinc plated or stainless steel hardware fit over 2000 popular valves and actuators. A high strength spring tempered Monel drive yoke/coupling is tailored to fit securely to a specific valve or actuator stem. There is no slippage or binding. No special alignment fixtures are required due to switch offset design and yoke to stem engagement that makes installation a "snap". 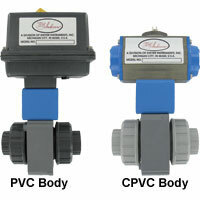 Each kit is specially designed for a particular valve or actuator; making field mounting simple with standard tools. 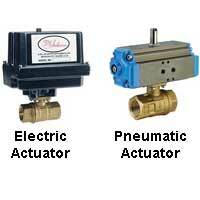 Please specify make and model of valve or actuator on order. Mounting kits can be used interchangeably with all models since external mounting features are identical. 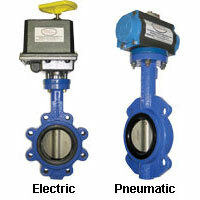 Rotary valves utilize direct drive couplings and a slotted lever drive is used with linear valves. Lever drives convert linear motion to rotary. 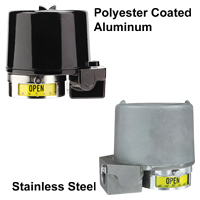 Stainless steel visual indicators are standard for direct drive, automated quarter-turn valve applications. EXAMPLE 1 2 V D 0 STR Series 12VD0-STR Mark 1, 2 switches, SPDT snap switch, direct drive with visual indicator, aluminum painted black, with riveted stainless steel tag.